Binomial name: Spathodea campanulata P.Beauv. The tree grows between 7–25 m (23–82 ft) tall and is native to tropical dry forests of Africa. It has been nominated as among 100 of the "World's Worst" invaders. 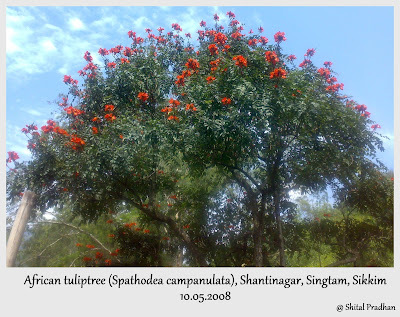 This tree is planted extensively as an ornamental tree throughout the tropics and is much appreciated for its very showy reddish-orange or crimson (rarely yellow), campanulate flowers. The generic name comes from the Ancient Greek words σπαθη (spathe) and οιδα (oida), referring to the spathe-like calyx. It was identified by Europeans in 1787 on the Gold Coast of Africa.